Consider a typical cannabis farmer, growing an indoor crop. In a protected, controlled environment, they can grow a profitable mix of high-potency, medicinal marijuana and any number of milder strains appealing to a new market. But the venture comes with both a business and social overhead: high energy bills and a heavy, carbon footprint. "It's a big problem," said Tim Hade, co-founder of micro-grid company Scale. "It has an impact far beyond cannabis consumption." A recent study estimated a single, indoor marijuana plant takes the equivalent of 70 gallons of oil to grow. Energy demand at Colorado's largest utility grew about 2 percent after marijuana was legalized. Hade said the growing industry could wipe out gains the country made in the last decade that kept energy consumption stable even as the population and economy grew. As the legalized marijuana industry expands in California, it could seriously challenge state goals to reduce greenhouse emissions. The cannabis industry is starting to address the issue. Startups are hunting for ways to make growing more efficient. Farmers are innovating and experimenting. Evan Mills, an energy and climate change scientist based in California, said the cannabis industry could make efficiency gains in almost every step of its process. According to Mills' research, the total amount of energy used to power marijuana farms is equivalent to powering 2 million homes, with emissions equal to 3 million typical U.S. cars. Mills said the key change in the industry is a trend toward large-scale cannabis cultivation "which may prove to be far more energy intensive" than the current collection of small-growers. Scale, based in New York, combines solar, battery storage and natural gas generators in a system that can cut energy cost by up to 35 percent. Hade, an Air Force veteran and Stanford Graduate School of Business grad, said the system uses excess heat from generators to fuel air conditioning. With about 30 percent of a farmer's overhead spent on fuel and electricity, he said, "you have to be sophisticated about energy management." JP Martin, founder of GrowX, a company in the cannabis accelerator Gateway, has focused his company on making indoor growing more efficient. The startup has produced prototypes for an aeroponic growing system, with sensors, lights and a mesh growing medium. It's testing the system with two customers. Martin said the system uses less energy and water than hydroponic growing, and eliminates possible impurities and disease developed from soil. 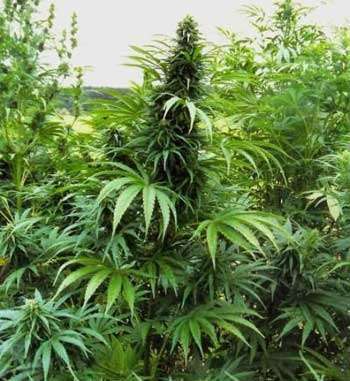 Cannabis grown indoors is often believed to be more potent - and is more expensive - than crops grown outdoors. "Traditional farming is a broken model," Martin said. But even the promise of new technology - including energy saving LED lighting, sensor-filled growing pods and a network of artificial intelligence and high-efficiency electronics - may not be enough. "In this warming world, indoor farming is an environmentally unaffordable luxury," Mills said. "Even deep energy savings leave indoor grows as energy-intensive as most ordinary buildings." Some farmers have taken a traditional, natural approach to growing. Cyril Guthridge, owner and operator of Waterdog Herb Farm in Mendocino County, Calif., plants outdoors. He searches for the right combination of plants and environment to produce high-quality strains of marijuana on his 160 acre homestead. He has several friends growing indoors and producing great crops, he said. The process can produce high-quality crops, but is usually three times more expensive, he said. But Guthridge wants to fill a niche for high-quality, naturally grown marijuana. And his farm is off the grid, powered by renewable sources. "Nature is providing us with a very good environment," he said. Growers in the True Humboldt collective, in rural Humboldt County, Calif., also strive to produce natural products, with less environmental impacts. "The most energy-efficient way to cultivate cannabis in California," said Chrystal Ortiz, a representative for True Humboldt, "is using our (California) sunshine as a primary light source." The idea was to make cannabis an open source material, not a business supply chain. The current methods are keeping black market "deals" going, although they are a lot different that prior times, it still goes beyond the law. Just, get over it and let people grow their own during the summer. The energy will be significantly reduced. Let the commercial farmers pay for what they use, which will be much reduced since it is quite easy to grow a years worth of cannabis in the summer.